New Delhi: From commenting on each other’s social media posts to getting clicked together on vacations, Bollywood’s rumoured couple Ranveer Singh and Deepika Padukone often set new bars for all of their fans. This time the two were seen grooving together on ‘Khalibali’ song from their blockbuster movie ‘Padmaavat’. 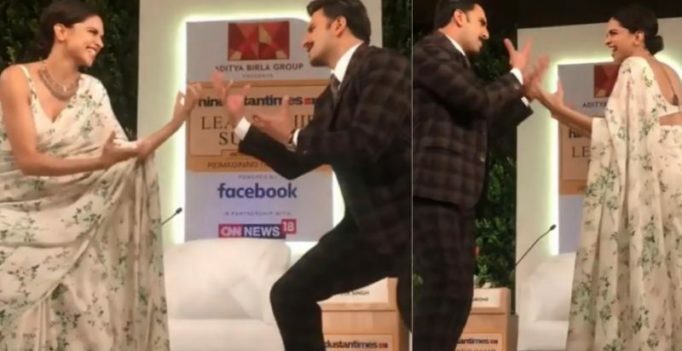 Taking to his Instagram account, the ‘Gunday’ star posted a video in which he can be seen dancing and having a great time with his ladylove during an event. The duo ended the video with a warm hug. Bollywood’s ‘Bajirao’ and ‘Mastani’ have been inseparable since Sanjay Leela Bhansali’s ‘Goliyon Ki Raasleela Ram-Leela’. On the work front, ‘Chennai Express’ star is set to portray the role of an acid attack survivor in her next film while Ranveer is prepping up for ‘Gully Boy’, ‘Simmba’, ’83’, and ‘Takht’.